Q1 S&P 500 earnings are set to show a yearly decline as firms are facing extremely tough comparisons. Considering how prevalent this story is about to be, it’s important to review the positive news. While Q1 estimates according to FactSet call for a 3.9% decline in EPS, revenues are expected to increase 4.8% as the revenue comp isn’t as tough. It’s worth noting that right before earnings season estimates usually drop so that most estimates end up being beaten. It’s not that there are nefarious analysts out there trying to trick you into buying stocks. Instead, firms give beatable guidance and analysts base their models on what firms project. Smart investors follow the trend in estimate revisions to make sure they aren’t fooled. We follow estimate trends of the overall index. Usually estimates fall, but if growth is positive, this isn’t a problem. 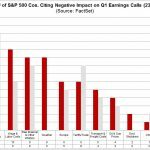 Q1 earnings growth will be negative unless estimates aren’t lowered further and there are big beats. 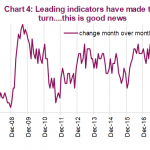 As you can see from the chart below, technology led the pack with negative revisions this quarter as the semiconductor industry is weak and the global economy is pulling down firms with international exposure which tech leads the pack in. That being said, this isn’t a disaster because tech usually leads the pack in this category. Its 5 year average of firms with negative revisions is 20.2 which is the highest out of any sector. Healthcare had the highest differential of negative versus positive revisions. The healthcare sector saw 14 more negative revisions than positive ones; its negative revisions were 5.9 above its 5 year average which was the worst differential versus a sector’s average. The best differential between Q1 guidance and the 5 year average was industrials which had 6 negative revisions this quarter and has 10.1 on average. For us, the great jobless claims report puts less pressure on March’s BLS readings because we are sure it will be better than February which showed only 20,000 jobs created. As you can see from the chart below, jobless claims fell from 216,000 to 211,000 which was below estimates for 225,000. The initial reading for the last report was 221,000. Therefore, from what it was initially reported last week to this week, the 4 week average fell from 225,000 to 217,250. Investors sometimes joke that you could only follow the jobless claims and be a great investor. The 4 week average is only 6,750 above the cycle low in September. It’s very wrong to cite that bottom as somehow meaningful. There will usually be a bottom in the past unless we are at a cycle low. As you can tell, even when the trend is lower, the cycle low isn’t always hit each week. Even when the 4 week average was at 229,500 in February, it wasn’t high enough to cause major concerns. It’s notable that after 5 weeks of the 4 week average being above the previous year and one week where it was flat, the yearly growth rate has turned negative as it is now -1.6%. Pending home sales in February were very weak. They don’t reflect the emerging growth in late March caused by the collapse in mortgage rates. As the chart below shows, the pending home sales index was 101.9 which is down 4.9% year over year. This was the 14th straight month of annual decreases. Once again, the South led the charge and the West was in the worst shape. The West has had bad weather, has seen some cities negatively affected by the weakness in tech, and has seen its hottest markets like Seattle, cool off. The South is the biggest housing market, but it couldn’t pull growth up since its pending home sales were down 2.9%. Its overall index was a strong 121.8. Sales fell 9.6% in the West as the index was 87.5. The Midwest saw sales decline 6.1%. Chicago has seen week price growth for the past few months. The Northeast had the lowest decline as sales only fell 2.6%. The top chart below shows there is a 48% chance of a recession with the 2s 10s curve at 12 basis points. The latest update is the curve is at 13 basis points which would put the recession percentage a bit lower. We think you should fade this analysis, especially the bottom chart which shows there is a 99.5% chance of a recession when the differential is at -10 basis points. 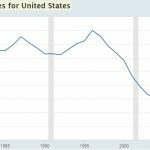 This reminds us of analysis which showed the percentage chance of a recession based on the length of the cycle. 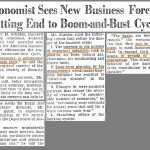 With the cycle almost the longest since the 1800s, that analysis would say there is almost a 100% of a recession soon. Unfortunately, both examples don’t have that many data points because there haven’t been many cycles in the past few decades. To be clear, the yield curve affects banks’ ability to lend, so it is more important than the length of the cycle. However, we are skeptical of a model that shows there is a 99.5% chance of a recession based on that one indicator. This is only one metric using just a few data points. 74% of NABE panelists saw the U.S. economy’s risks tilted to the downside and only 6% said the upside. That is based on the current slowdown. 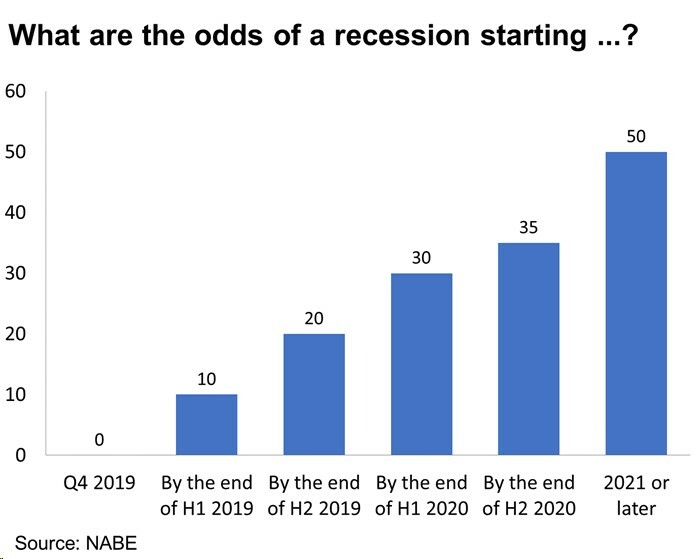 However, as the chart below states, most aren’t calling for a recession by the end of next year. It seems like whenever these questions have been asked in the past few years, it’s common for respondents to say there will be a recession in a few years. It’s tough to call for a recession in the near term as there is little evidence of one. However, there might be bias to project a recession relatively soon because of the length of this cycle. The takeaway here is to be careful of assuming there will be a recession a couple years from now because this goalpost can easily be moved to 2022 and beyond. Jobless claims are low. If they correctly forecast a solid March labor report, predictions for a recession will die down even with some parts of the yield curve inverting. Earnings will decline slightly on a yearly basis in Q1, but it’s far from a disaster as revenue growth will be solid and Q2 growth is expected to be slightly positive. Look at the effect Q1 guidance has on Q2 estimates to formulate your investing opinion. Interestingly, the 10s 2s curve says there might be a recession soon, but most economists don’t see it yet. If you don’t trust NABE economists, use this as your understanding of the consensus which you can bet against. NextIs The Stock Market Right To Rally In Q1 2019?